Ignition, along with US Army, sponsored the Marvin Lewis camp run by ProCamps this past Wednesday. 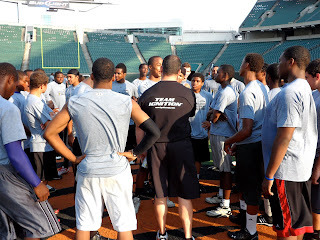 It was a great night and huge success with about 200 high school football players training with Ignition on the turf at Paul Brown Stadium. There were athletes from all over the city between the ages of 15-23 who came to develop their speed and agility to help them perform at their fullest potential. The clinic was a free event, and the registrants also received Under Armour t-shirts, free Army gear and a free Ignition bag. The kids got to start the night hearing from Coach Lewis on the practice fields before heading over to the stadium where they got training like the pros get, on the field the Bengals compete on every Sunday… what could be better. The Ignition trainers split athletes into three groups and took them through an explosive workout, starting with some Army style push-ups and sit-ups before a tough Ignition session to improve their speed, strength and agility. Possibly the most well represented school at the camp was Mount Healthy High School, with 40 athletes that attended. Head Strength Coach Luke Day didn’t want his athletes to miss out on this experience, “nobody does combine preparation training better than the Ignition Team. To have our guys get this experience at Paul Brown Stadium was an unbelievable opportunity” says Day.